Troy, MI – PriveCo, the world’s most private company, has officially launched their newest web store, OverTheHill.com. The new online storefront includes only the best and bawdiest Over The Hill merchandise, from hilarious gifts to festive party supplies. 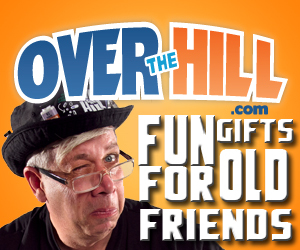 OverTheHill.com specializes in fun gifts for old friends. OverTheHill.com carries specialty gifts for those milestone birthdays: 30th, 40th, 50th, 60th, 70th and any birthday in between. OverTheHill.com’s wide selection of products makes it easy for party planners to find everything they need to throw a memorable Over the Hill bash. OverTheHill.com offers shoppers an upbeat, entertaining shopping experience, with the built-in security that only a PriveCo store can offer. At OverTheHill.com, you’ll also find all kinds of free party ideas and party planning checklists. OverTheHill.com supplies free birthday facts and trivia for milestone birthdays. You can also download free invitations, free party placemats, and free games at OverTheHill.com. These offerings make planning the best Over The Hill party easy and economical. Visit OverTheHill.com to plan your next Over the Hill birthday party. Fast, fun, secure shopping awaits you. About PriveCo PriveCo Inc. sells anything that would be embarrassing to buy in the store or pharmacy. In business since 1998, PriveCo operates 9 retail sites including ShopInPrivate.com, the world's most private drugstore, Bachelorette.com, Vibrators.com, and RomanticGifts.com. PriveCo has privately delivered over half a million packages to over 75 countries. PriveCo offers easy shopping, fast delivery and holds your personal information in the strictest of confidence. Tom Nardone, the President of PriveCo, The World's Most Private Company, is available for questions, comments or conversations at 1-800-809-0610.